Just like the Apple Pencil. Essential for life. Best RDP App/Program our there. Long time user, (purchased first license in 2012 I believe) and I've never offered my gratitude for this program that I use at least 300 days a year. Phenomenal, so stable, brilliant on MacOS and iOS devices, seamless between Mac and Windows, blows any other RDP our of the water. Just keeps getting better with time. The app description is misleading. Under "VNC Features" it says: "Secure: Supports SSH tunneling as well as SSL encryption". People familiar with VNC would normally interpret "SSL encryption" as "encrypted session," like TigerVNC's TLS and X509 security types. What they don't tell you is that actually only unencrypted direct connections are supported. The maximum security level you can choose is "VNC password auth," which is extremely weak security and does NOT encrypt the session. None of the more advanced security modes of, for example, RealVNC or TigerVNC servers are supported by this app, not even the TigerVNC features which are open source and widely available in desktop clients. There is not even an option for "TLS/SSL" or anything similar in the VNC connection settings. The only way to connect securely to a VNC server with this app is to set up an SSH tunnel. This causes a noticeable performance hit, but at least it does work - provided your remote server allows the weak VNC password authentication. If that was all, the app might not be so bad - SSH tunneling is a useful feature. BUT: An additional problem is that when I hover the mouse over window corners on a remote Linux desktop (server software doesn't seem to matter), nothing happens. 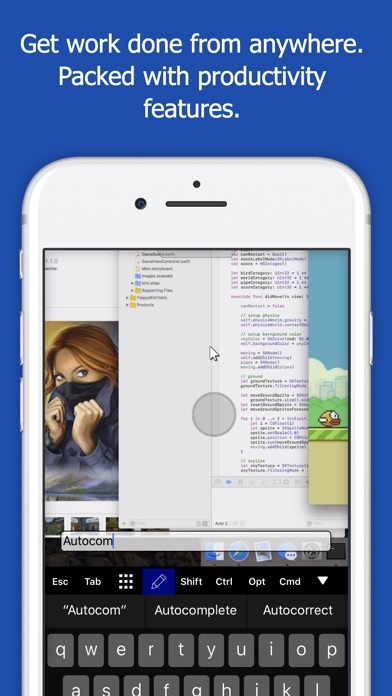 Normally, this brings up a window resize icon, which I can then drag to resize the window. Not so with JumpDesktop. There seems to be no way to resize windows with the emulated mouse. Maybe it works if you buy their special $50 hardware mouse, but no thanks. Finally, the keyboard mapping of the on-screen keyboard is broken for most special symbols, at least when connecting to a TigerVNC server (which, the description says, is supported and "tested"). Try entering a "+" sign with the on-screen keyboard. Tapping "+" does nothing. Similar with many other symbols, e.g. ">", or simple punctuation like a semi-colon ";". I can only enter these with an external bluetooth keyboard. Maybe this app's strength is RDP, but as far as I can tell it surely isn't VNC. Unfortunately, these various bugs make the app pretty much useless for me. Unfortunately this did not meet my needs. I was looking for a way to remotely access my MacBook Pr from my iPad. My previous remote app (Parallels Access) works great until the laptop resets. Then I can't access the laptop. I read a Jump Desktop response on their support forum that said it works even when logged out, so I decided to give it a try. The Jump listing said it includes a $50 discount on the Swiftpoint GT mouse, so I figured even if it didn't work, I would still be $35 ahead. Alas, it doesn't work if the computer has reset. After digging into this a bit, I'm pretty sure no Remote Desktop will work if you have Apple FileVault enabled. That's because with FileVault enabled, the Mac won't unlock the disk and start up the remote servers until the password is entered on the physical Mac. So this app didn't meet my needs. I tried using it a bit, and found that I like Parallels Desktop better. Parallels Access allows you to pick an application, then it sizes that application for your mobile device screen. Jump shows you the entire desktop, so you end up having to mess with zooming and panning a lot to get the application at a usable size on the mobile device, Still, I figured I had a backup if needed, and with the Swiftpoint GT coupon, I'm still ahead. EXCEPT... when I went to redeem the coupon, it is no longer valid, I believe it is illegal to bundle a coupon with a product and not disclose the expiration date of the coupon. Even if it is legal, it's dishonest to advertise a feature that is no longer supported, So do your research. If Jump meets your needs, then great. But don't expect the coupon to work. One of the best purchases I ever made. Keeps getting better update by update. Using windows 7 for both home and work computer and accessing it via iphone or pc. Recently it would connect, freeze, and then I am no longer able to connect even the pc is still on. I am not sure what can be done to fix it. Pc to Pc seems to work alright but once it “appear” offline even though it is still online, I cannot access it via Pc or iphone until I restarted (which now I cannot since I am supposed to telework tomorrow). Help! Performance is a big issue. The lag is a huge problem for jump, I don’t know why there are only a few people reviewed that. with free MS Remote Desktop and 200M network between the client and the server, I feel that I am not really using RD, but with Jump, it is so bad when video is involved. The only good thing about Jump is that it allows me to use a Citrix X1 mouse which is $60, not every one is willing to invest so much on a basic mouse though. Please fix the lag issue, for now, I can only give you 1 star, since there is free MS Remote Desktop is way better than yours. I am a physician who uses this app to access my windows-based EHR software on my iPad. I have tried several other apps, but have always found the speed or functions to be lacking. Jump desktop has been outstanding in this regard and has allowed be to ditch my PC and use my iPad exclusively. Had issues with using this on iPhone 7 whereby the App would keep logging me out & asking me to login again via an endless loop but ... ... it seems to be working fine as of July 19, 2018. Love Jump Desktop. Small thing: wish you could enable windows shortcuts by default. I use this to remote in to almost a dozen computers, and it’s the smoothest I’ve used! Love it! I’ve been using this app for years and have no complaints. SSH tunneling with key pair support is a god send and eliminates the need for battery-killing VPN. I only wish it had an SSH client as well. Really beats all the other RDP clients. Comm software can be so tricky and flaky but this program does it right. Continues to impress me. Awesome! Updated iOS & now it only connects intermittently. Using iPhone 7 on T-Mobile's LTE network. I work on many remote servers/workstations and completely replaced my laptop with the iPad pro with smart keyboard. I was using multiple remote desktop solutions depending on the host I was connecting to. With Jump desktop I am able to just use one piece of software. I just received the Citrix X1 mouse and its a must have. As a software engineer I am always sensitive to the quality of software that I use that has been written by others. Jump impresses me as being one of the best-designed and best-functioning software products that I have begun using in many years. The design of its ability to create on my local device an interface to my desktop on a remote host is well thought out and excellently rendered. I have used it several times a week for many years to extend my connect time with my software development projects on remote hosts no matter where I am, be it in a restaurant, a customer waiting room, or anywhere, and it has always worked flawlessly. An easy five stars. After using several other remote apps with less than impressive results. I decided to spend some good money on this app. Can’t say enough good about it so far. I was immediately pleased with ease of set up and connecting to my work computer. I connect to my Lenovo work computer using either my MAC, IPad Pro or my IPhone. All work smoothly and the resolution is so much better. I can actually see the remote screen clearly. It’s also fast connecting and stays connected with very little latency. I use this often so it’s well worth the money. Go for it! So, I ran out the office one day and I forgot to file a document electronically. When I got home, I didn’t feel like going back to the office, so I downloaded this app. To be honest, I thought I was getting fleeced for almost $15. However, the intuitive interface, comprehensive keyboard functions and instructional video made my task almost as easy as if I was at the office (but saved me a drive back to the office). I did what I needed to do reclined on my couch in comfy slippers. The app is worth every penny. Excellent app, well worth the price. Plays nicely with OSX. Works well on WiFI and cellular. Nice option for cellular to reduce needed bandwidth by using grayscale. I use it frequently to manage my machines remotely. Works well with tunneling. To the developers of this app.... You are the best! I was so amazed to see that all my keyboard shortcuts, including alt+tab work so well in RDP. Please add direct Windows Multitouch Support for Fluid. Now I CAN leave my laptop behind! There is no hyperbole in this comment. I set up a VPN on my home network and complement it with Jump. I have installed it on my iPhone, iPad, Mac Mini, and MacBook Pro. I use it to connect to my desktop (Mac Mini) when I am away from home. I also use it from anywhere when I connect to my Ubuntu file, and network servers, and any one of my Ubuntu Virtual Box VMs. It is a proven winner for me using RDP, and VNC protocols. Since I have access to my home desktop, I can do my remote software development work without having to be stuck at home. The only downside is that I occasionally lose connections. This may be due to weak WiFi or when my OS goes to sleep, I don’t know. But it is super easy to re-establish the connection manually. I think I spent $10 in the App Store and is totally worth it. I compared with several RDP apps which are either free or for a fee (including the remote desktop from the software giant) before I committed to Jump. Jump is definitely the better value on all platforms. Connect to my MacBook Pro and windows 10 pc with 3 monitors. This app does not work well. The app won’t work if you don’t have a password for your Windows logon. In addition, the “easy” connection is anything but. I was looking for a better alternative than Google Remote Desktop, but this is actually significantly worse. I’ll be getting a refund from Apple ASAP. Save your money and find something better than this crap. I can't figure out how to use this multiple monitors connecting to either my MBP or Windows 10 PC. I really isn't faster than RDP or VNC. I'm kind of disappointed. I bounced around a few of these apps until I found these guys and I’m impressed. The mouse was expensive but a total game changer. Turns my iPad into a real computer when I need it to. Absolutely amazing. 6 stars. Honestly, I would have paid a lot more for this. Totally worth it. This is the best I've used to access to my PCs, really amazing and beat any other system. Thank you jump desktop!. could you refund to me?? hi. i bought this app for screen mirror with pc for see some video. but sound dosen’t come out via ipad. This app is far beyond the capabilities of its competitors. It’s amazingly smooth and just works well. Why is there no ability to group connections? As an IT professional who uses this consistently to manage customer environments, having the ability to group connections would make this app an easy 5 stars. Please consider! 20 years with remote desktop says this is the best. I've worked with so many different RDP packages, protocols, apps on probably every operating system (host and guest) except for perhaps Android* and DOS. I am so impressed by the work these guys have done on Jump that I felt it necessary to write a review (something I very rarely do). I even used Jump years ago and put it aside because, At the time, there were other better solutions. But in the meantime they've been hard at work. The "fluid" desktop is amazing - surpassed only by Jump's own version of Microsoft's RDP access into Windows 10 desktop and/or Windows Server 2012 R2. (I also am running a similar set up but against Windows Server 2016, but for some reason it's just not quite as snappy. It might be a setting somewhere along the way or perhaps that particular hardware configuration. But the resolution transition down to my iPhone 6+ seems to be harder to work with and either things on the desktop are too small to see or it requires a lot of panning and zooming.) But for The first time ever, I can actually work productively in Visual Studio 2017 running on my desktop with two large monitors - remotely from my tiny iPhone 6+ screen. That is amazing! After recently returning to Jump after a hiatus of several years, it's now my "go to" RDP solution from any device to any device, desktop, operating system or environment, physical or virtual. Whatever the case may be, moving from the Windows desktop to a remote session from one of my IPhones or iPads is about as seamless a transition as I could ever have imagined. Trying to do that same thing except targeting one of my Mac desktops (and yes, from those same iPhones and iPads) is painful and frustrating. Even with Jump's iOS apps. Obviously Apple doesn't give the Jump developers much to work with since it's almost impossible to RDP even just between any two Apple devices or machines. (Check out ARD 3.8.x or whatever version they say they're so thrilled about out in Cupertino and you'll see what I mean.) Kudos to the folks behind Jump. Excellent work! * Why not android? I've always been both an Apple and a Microsoft power user for decades. But I'm finally about to drop Apple after 25 years when I buy my first Samsung Galaxy 8+ or 9+ sometime in the next few weeks. Apple has become as arrogant and out of touch with reality as Microsoft was in the 90s. The last two years has been one frustration with Apple after another, headache after headache. See you later, Apple. With all that brainpower out in Cupertino and all the self-genuflecting "genius" embodiments heaped upon all the Apple Stores in all the malls across the country and around the world, it turns out that a relatively tiny company called Jump not only ate their lunch, but did so without an army of messaging experts, PR disaster handlers, or product image inflators running around trying to convince everyone that their 23-month-old iPhone only appears to be suddenly useless because Apple so thoughtfully (and quietly) added a clever new.... "feature!" that throttled your battery phone's computing power back to just 25% of the power it had new. And just in time for its latest product launch too! (At a time it needed the goosed revenues more than ever. Update: Feb. 07, 2018 Changed my rating to 5-stars. Works for 99% of the time ... which is good enough for me. Doesn't work on iPhone 7 on T-Mobile's LTE network ... only works with wifi connection which defeats the whole point of why you would buy this app. All modifier keys work like a charm!!!! I've tried multiple remote desktop apps on iOS using a bluetooth keyboard, but they all fall short when using modifier keys. This app handles all modifier keys like a charm!!!!! Just wonderful! When I'm connecting to a Korean Windows PC, even the right alt key (works as switching between Korean and English) works perfectly. For Koreans: 윈도우 한/영키로 한영 전환 완벽하게 됩니다!! It works perfectly and isn’t choppy like those free remote desktops! Worth the money! The app is a solid 5-stars. There is just one minor thing: in the iPad Pro 2018, the app shows black bands at the top and bottom of the screen. I’m sure they will fix this very soon. Thanks for this fantastic app! This app is what makes my iPad complete, from a companion device to my main device! Spent $20 years ago and the app has been great. Always being updated to stay current with various remote connection tech. Being able to remote into my and clients PCs and Servers from my phone has been a “save the day” more than once. With my iPad, Apple Pen, and a keyboard, I can login to my work computer flawlessly. Better than my laptop. I can’t tell you how many times I didn’t have to go into the office or have to lug my laptop around. I can’t say enough great things about this app. Every day I find something else it can do. I run two screens at work...NO PROBLEM. Love Love Love this app. The navigation is very intuitive. The response is very fast. The automatic setup was super easy. It is running great on my 12.9” iPad Pro. I do have a feature suggestion - the ability to create folders so I can organize all of my connections. Stop looking for an rdp program for iPhone and iPad. This is extremely reliable, great connection, and executes any PC program on my computer, so I'm never away from home. Critical files...at my fingertips. Need to write a customer invoice and mail it to my customer (or to me to print), can do. Super productivity in a one-time expense. The fluid protocol is a killer. Blazing fast that you can even see windows animations. this is the app that is allowing me to do my job as a physician using an iPad Pro. I had to buy a mouse which has an annoying delay over the Remote Desktop but everything else is awesome. I can literally just work from home now. You can’t beat that! It took a little back and forth with support, but once I got the RDP option working I was impressed as hell. Screen is scaled perfectly. Pointer is smooth as is animation. Support folks were PATIENT and HELPFUL which is RARE for most app developers. Would definitely recommend! Need a vnc that allows me to click-drag and this app fails at that. Otherwise, easy to connect and view desktop. VERSION 7.4 keeps crashing! I can use it for about 10 seconds before it freezes. I love this app, please fix it. This app is the best remote desktop app hands down. This app has saved me from pointlessly driving to work just to do a simple task because i can just do it on my phone now via Jump. This is a great example when strong technology is backed by great UI. Works perfectly. I love how it supports mouse and different clicks. Worth every penny. Best $15 I'll probably spend today. I'm using this app to connect to multiple Linux servers, through a SSH tunnel. It installed and configured fine, and I have found the mouse control using an iPad Mini to be accurate and intuitive. One enhancement I'd like to see in a future version is the ability to 'Name' SSH connections. My IP addresses for each server are all the same (only the Port # is unique). So, I end up with a list of 8.1.1.222 SSH servers in the list, and have to open each to find which is which. If I could name them 'Server A', 'Server B', etc., it would be a little more elegant. Aside from that, it's so cool that I don't have to do this from a laptop at home any more! Good job! Love the app, I engineer TV an radio stations and having this app allows me to check on stations without having to be on site. It's a great tool. This app has been a very valuable tool for my work as a Clinical Application Analyst and I have completely depend on this to remote in to my desktop at work when I am on call and do not have to log in to our server and use VPN for this. I used to always have to bring my work laptop at home when I am on call. Now I leave it at work and use my iPad instead. One time I was called during my nephew's birthday party which was in our city zoo! All I have is my IPhone and all I need is quick access to an app in my desktop and I was able to use my freaking phone to do what I needed to do. That is so awesome! I love you Jump desktop! I even used jump desktop during a presentation because I used my iPad. My CQO saw me using my iPad and ask how she can do that as well as so she can use her iPad Pro. I told her about Jump desktop and now she's using this too and loving it!!! You rock Jump desktop! Do you work overseas? This is as good as Remote Desktop apps for the iPad/iPhone get. It's completely changed the way I interact with my desktop, literally can't remember the last time I sat done in front of it, as I can now do everything via my iDevices from the couch, or in the office, or in a dentists waiting room or... in the passenger seat of a car heading down the highway. Works great with a Citrix X1 Mouse too, it's literally like having a mini desktop anywhere and everywhere, it's brilliant! Edit: By the way, any word on when audio support for fluid will be added? Thanks! I've tried both Jump Desktop and Logmein. Jump Desktop provides a much more intuitive interface that makes JD easy to use. JD is very reliable and stable and works without a hitch. It is one of the key apps that extends the functionality of my iPad into the desktop world. Love it. Highly recommend it. 5 years on, still a go to app for me and the best remote desktop. Beats Microsoft Parallels too and without the monthly cost. Now I can access my windows computer, and use a physical mouse, on my iPad Pro 12.9!! Left my Mac at home..
Don’t need it thanks to Jump Desktop and Citrix mouse for RDP! Only one small request, I have a new iPad Pro 12.9” with USB-C out, can you add external monitor support in the next update? This does not work! Tried on iPad Pro and two different windows 10 workstations. 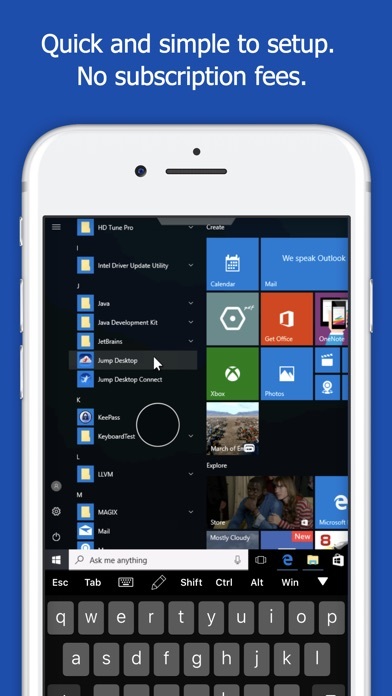 I’ve been using this app for over a year and although the mobile app is great, the power relies on their continued and active development with their desktop app as well. Well worth the price. Thank you for making this a non subscription based purchase. Or you would have seen that the notch eliminates the ability to exit the session. Best Remote Desktop out there. Big fan of this RDP client for Mac and iOS. I appreciate the connection list synchronization and the password management capabilities. The developers are responsive to issues and suggestions, as well. Recommended! The app should be a solid 5-stars, but there is just one minor thing: in the iPad Pro 2018 the app shows black bars top and bottom of the screen. They break the immersive experience and reduce the usable screen size. I have seen other apps with the same problem. Update (answer to developer): the iPad 3rd gen has exactly the same gestures as the other iPads, swipe up from the top or down from the bottom edges show the dock, invoke Notification Center, etc. On those devices with the same system gestures the app already takes the whole screen and looks gorgeous. “The Notch” issue has been addressed. SUPPORT TEAM FOR THIS APP ACTS QUICKLY. Great product, Great team. JUST BUY IT YOU'LL BE HAPPY. BEST OUT THERE RIGHT NOW. I’ve been using Jump on my iPhone and iPad for around 7 years, and in that time never once felt compelled to find a different RDP/VNC app. Keyboard and mouse input are both handled very well. You can do all the weird special and modifier keys needed to control Windows, combine them with mouse clicks, the works. The virtual mouse is precise and intuitive, with touch-and-hold right-click, double-tap-and-hold dragging, two-finger swipe scroll wheel emulation, and probably other things I haven't discovered yet. Bluetooth keyboard support is outstanding. Jump supports all the modifier keys nearly as well as an actual Windows machine. Multitasking support is great. If you need to reference something in, e.g. Safari, iBooks, or Mail, go right ahead - your connection will still be open and waiting when you go back to Jump. If you take too long and iOS suspends or closes Jump, it will automatically reconnect your session as soon as you open it again. (Just make sure the server you're connecting to isn't configured to automatically log out disconnected sessions!) And you can take advantage of split view on iPad. Proper support for the iOS clipboard is included. You can copy and paste between your local apps and the remote session just as you might with a desktop RDP client. Huge, huge plus. It's also possible to print a document on the remote system, and have it sent to any AirPrint-supported printer available to your iPhone/iPad. Jump supports SSH tunneling, defined per connection, which is great if you use tunneling as a quick-and-dirty VPN, like I do for accessing my home computer. Once configured, there are exactly zero additional steps in connecting to the machine. The ONLY missing feature I can think of that I'd love to see is the ability to switch between multiple simultaneous connections. As it stands, you have to disconnect and then connect to a different machine. If you're feeling adventurous, you can always RDP to one machine, then use an RDP client on that machine to open a couple more sessions. Not ideal, but still usable. 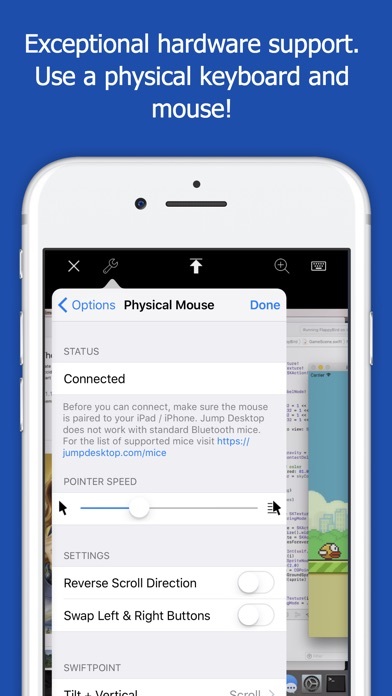 Bottom line: if you're in the market for a remote desktop app for your iPhone or iPad, then Jump Desktop is worth every penny. Let me put it like this... I wouldn’t have kept my iPad if it weren’t for Jump Desktop and the GT mouse! Thanks a bunch! I've been using Jump Desktop for many years. It's probably one of the most used apps on my phone, other than apple native apps. And it never fails to deliver the best, most reliable user experience. I've also used many other apps, Splashtop, Screens, iTeleport, you name it, none compared to Jump Desktop. Update on 2017-11-17: Jump Desktop just keeps on giving, free updates one after another, with amazingly useful and thoughtful new features. Seriously dear developers, you need to put out a paid upgrade! I would be gladly pay up, without any hesitations. Keep up the great work!! Great app! But what about audio? I'm running Windows 10 64-bit home edition I'm guessing it's because I'm using home edition that I cannot get audio. Is that why? When will there be an update to allow me to stream audio? It won’t except my windows credentials so I can only use this at home. I depend on this app daily and it does not work on the latest iPad Pro. I cannot sign in through the “Sign in with Google” as its grayed out. Disappointed this isn’t working and has not been addressed. 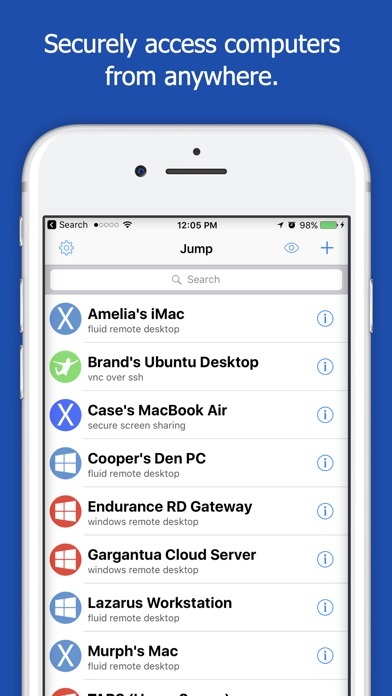 Jump is the best RDP and VNC app of any iOS app you will find. I’ve been using both VNC and RDP extensively on iOS for over eight years, I have tried or used just about every VNC And RDP app on the App Store. (Jump is the best at both protocols) Prior to buying jump, I had to use 4 x different apps due to server/app compatibility issues-(2x VNC iOS apps, and 2x RDP iOS apps). Buying jump was one of the best app purchases I’ve ever made, it does NOT have any compatibility issues with any of my 50+ VNC/RDP servers o use daily - thus jump has allowed me to replace 4x apps with 1. + jump does everything better than each of the 4x prior apps. Luckily, the iOS 11 update forced me to find a replacement for 1 of my 4 prior apps, I say luckily as this is what led me to Jump and I have been very happy using it for the past month and a half. (I got rid of all other apps after copying my various server setting out of them) Twice I’ve had to reach out to the developer for app settings questions ( settings that I had overlooked as they were already in Jumps settings menus) , the devs were super fast reply and super helpful. Stop looking and buy this app. Another nice feature is jump allows you to export your server list via your own email (this you can manage the security of that list , yourself, during an export need). Or you can use their optional signIN functionality to keep a encrypted backup / export on their servers (if you wish , this part is NOT mandatory , of course) My only motivation in writing this glowing review is how great jump has been for my uses / use case. Even when emailing with the app developers they never once pressured me nor even ask me to leave a review. This is hands down the best remote software I've used. Fluid is brilliant and surpasses all expectations with each update. Having RDP and VNC options as alternatives comes in handy as well sometimes. I primarily use the iOS app, but when I need to use the desktop app, it's great as well. Keep up the great work. For $15 I expected it to preform pretty well but the lag is aweful. Very limited controls as well. Still sticking with Splashtop until somthing better comes along. Bummer. Hands-down one of the best working apps I have ever experienced on the iTunes App Store. I can log into any computer connected to my network easily via my phone or iPad. The latest upgrades in speed and connectivity have been a godsend! Fantastic app. I’ve used a few different remote control apps and this one is the best. Easy to set up, easy to use and with a great user interface. I have 2 office computers - an older XP machine as an email server and a Windows 10 machine for everything else. I connect via my iPad Pro and connections are fast and secure. I had one little question after installing and customer support responded in minutes! Outstanding. Thanks for a great app! 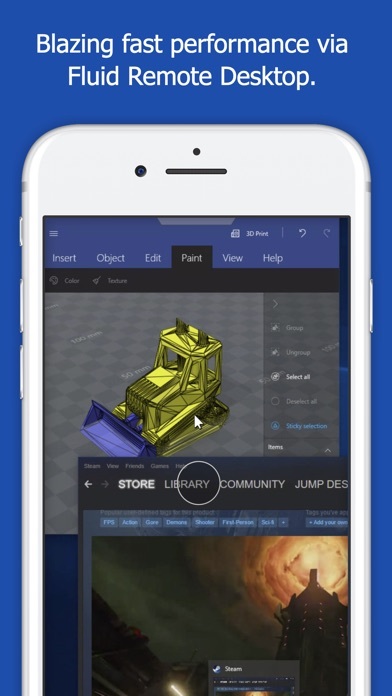 This app, combined with a Citrix mouse, allows you to work JUST like you would on a laptop. Wish they would add more keyboard shortcut mapping for things like CTRL-Z on windows. Edit: version 7.4.3 (currently in beta) has CTRL-Z and it works for me! It makes it so easy to administer my windows servers for my iPhone and iPad. I probably shouldn't do so much work this way, but luckily this app exist and it just simply does it the best. I also use it to connect to my Mac. It works great doing that too. I have been using it for eight years now. Tried other apps but they just don't click. This app, combined with a Citrix mouse, allows you to work JUST like you would on a laptop. Wish they would add more keyboard shortcut mapping for things like CTRL-Z on windows. As a retired software development manager, I find Apple apps are typically semi-vaporware that are NOT even worth free. I’ve been burned many times by apps written by amateurs who have either no Quality Control or piss-poor QA. So when I looked at the cost of Jump Desktop and all its extraordinary features and the cost, I thought, I’m going to get burned big-time, but I will give it a try anyway because it’s exactly what I need — IF it worked! Well Surprise, Surprise! I bought an excellent, well-written and designed app for pennies. The app is well worth more than $15! I love this app a lot. It’s nearly perfect expect it has one problem. I use my iPad Pro with the Apple keyboard and when I want to type anything in capital letters it would not go back to small letters. It is very annoying and I cant find a way to fix it. My iPad is on iOS 11.1.2. I use this app mostly for school and I do a lot of typing so Please please fix it ASAP.